The Treat Dressing is a Japanese wedding boutique that carries brands by popular bridal fashion designers Reem Acra, Vera Wang, and Ramona Keveza (among others) as well their own collection by in-house designers. Off-shoulder bridal dress with an Audrey Hepburn-esque nostalgic feel. 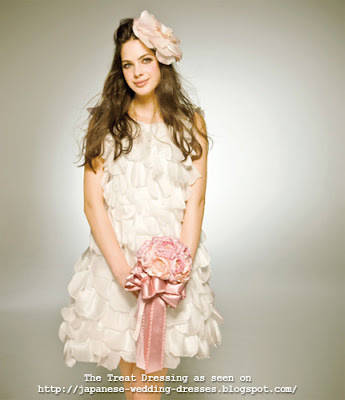 Pretty and pink strapless wedding gown. Skirt is composed of soft chiffon layers. Sweet and flirty 60s-style wedding dress. The waist is cinched with a ribbon belt decorated with rosettes. Find more darling gowns at their website.